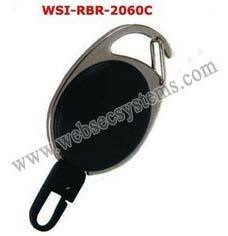 Backed by the perfect state-of-art-infrastructure, we are able to offer retractable clips (yo yo)-wsi-rbr-2060c. Our experienced professionals make sure the safety measures and reliability ofthe products before it’s launched into the market. This is carefully designed to hold the id cards safely without making it fall down with help of dual side safety clips. With easy open and close plastic hooks at one end and metal pin at the other end makes this product much reliable. Features: long lasting durability small and handy size stylish appearance weightless.